The Regional Database of Alternative Feed Ingredients in Aquaculture has been launched for public access as part of SEAFDEC/AQD’s thrust to bring down the cost of feeds in aquaculture. With feeds being the largest single cost item in aquaculture accounting for 50-60% of production cost, the database is intended to serve as a reference on the different feed ingredients that, depending on cost and availability, may be used to produce cheaper feed. 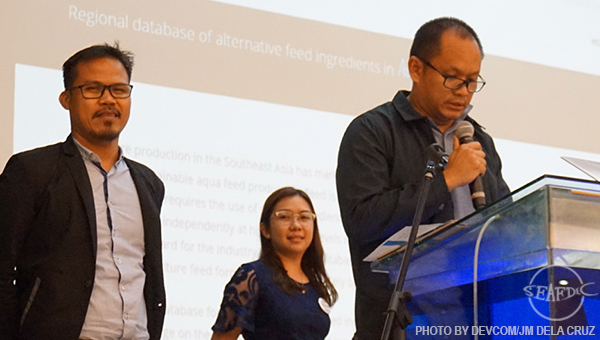 “Applying local ingredient alternatives for the formulation of an aquaculture feed is a way forward for the industry to remain profitable,” said Dr. Roger Edward Mamauag, a scientist at SEAFDEC/AQD and head of the Nutrition and Feed Development Section. The database currently lists 70 different feed ingredients along with their nutritional composition and optimal inclusion levels. The data have been culled from different scientific papers on fish nutrient substitutes which were found effective for commercial applications. More alternative feed ingredients will soon be added to the database as representatives from SEAFDEC member countries have also been tasked to contribute information regarding their respective local ingredients, revealed Joseph Biñas, associate researcher and part of the team behind the database. Biñas added that, in the future, the public will also be invited to submit their inputs to further expand the breadth of the database. The database is a collaborative effort between SEAFDEC/AQD and SEAFDEC member countries through their representatives with funding support from the Government of Japan-Trust Fund. Dr. Mamauag and Biñas launched the database during the Book Launching ceremonies as part of SEAFDEC/AQD’s 45th anniversary celebration on 12 July 2018. The database may be accessed at afid.seafdec.org.ph. Consul General Jia Li of the Consulate of the People’s Republic of China in Cebu expressed interest to promote cooperation between China and the Philippines with regards to the fisheries sector and hopes to make progress together with SEAFDEC/AQD.